If you own a building in San Bernardino built before 1980, you may be facing the need for asbestos abatement services. Asbestos was commonly used in older buildings in products including roofing, linoleum, sheetrock plaster, and insulation. When remodeling or demolishing an older building in San Bernardino, the abatement of asbestos materials is an important first step and often a legal requirement. Identifying asbestos in a building can be difficult, and only a licensed and qualified professional can develop a plan for safe and complete asbestos abatement. General contractors do not necessarily have the training, licensing, or expertise for conducting this type of hazardous materials identification and removal. In fact, asbestos abatement in San Bernardino and other locations in California must be done by someone with special state licensing and training. This is because asbestos fibers can easily contaminate surrounding areas inside and outside a building site. Preventing this contamination while removing asbestos requires specialized equipment, trained personnel, and experience in hazardous materials abatement work. The regulations for asbestos abatement in San Bernardino are especially stringent if the location is used for child care or operated as a school. Federal and State laws require a special contracting license for handling asbestos materials, and the contaminated debris must be disposed of in a waste disposal facility licensed for managing hazardous materials. Thoroughly inspecting all areas of the property for the presence of asbestos. Testing suspected materials to determine the type of asbestos present. Informing the property owner of where asbestos is found and working with them to develop the most cost-effective and safe asbestos abatement plan for their location. Removal of all asbestos containing materials to an approved San Bernardino asbestos abatement disposal facility. Coordination and reporting to third-party consultants as required by law. Asbestos is a significant health hazard, and abatement should only be done by a qualified contractor like Tri Span Inc. 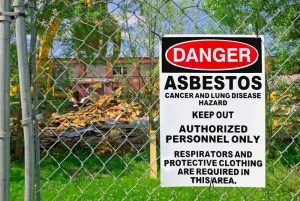 If you own a San Bernardino building or building site in need of asbestos abatement services, contact Tri Span Inc. today for a consultation and estimate.